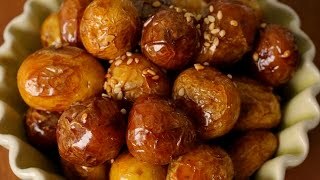 Today I’m showing you how to make a Korean side dish made of braised baby potatoes, called algamja-jorim in Korean. Gamja is Korean for potatoes, jorim means braised and al means egg, which refers to how small these potatoes are, like quail eggs. 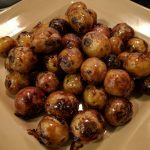 When these baby potatoes are braised in soy sauce and rice syrup, they become an irresistible, easy-to-eat, sweet, salty, banchan (side dish) that goes well with rice. 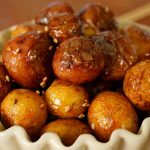 The secret to making perfect algamja-jorim is to get the potato skins crunchy and chewy at the same time and to keep the inside moist yet fluffy. 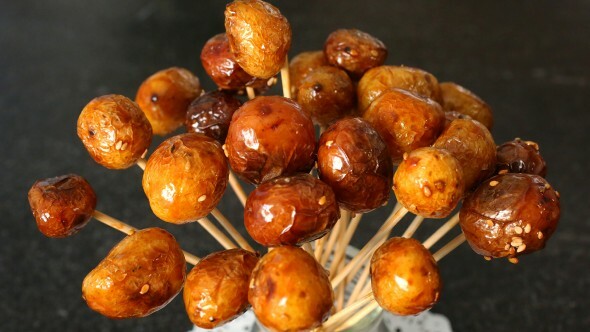 Well made algamja-jorim can go for hours without getting soggy, or losing their shine, which makes them a perfect dish for a Korean doshirak (lunchbox). You can make it in the morning, and by lunchtime it’ll still be perfect! It’s also a good mitbanchan – something you can make ahead and keep in the fridge for days. 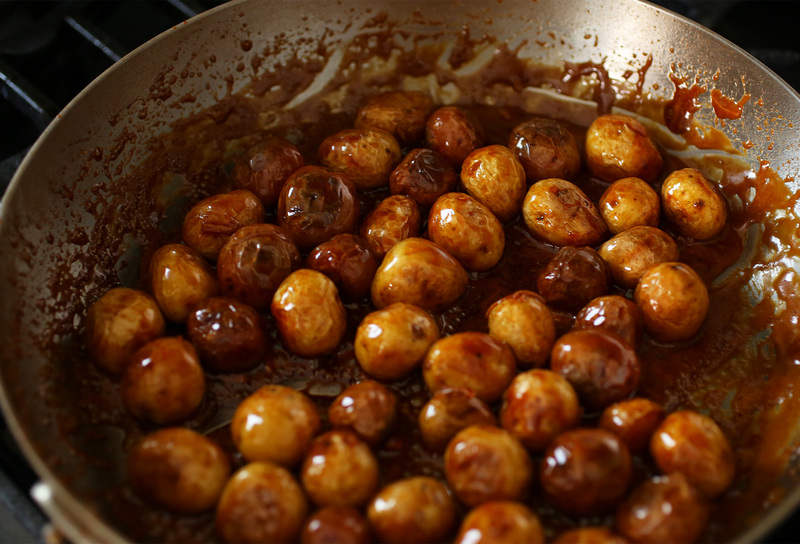 Make this, and I guarantee you will be making it again, it’s so delicious, sweet, and savory. Have fun and let me know how yours turns out! Trim any rotten spots or broken edges from the potatoes. Wash and rinse in cold water to remove any dirt. Strain. Add the cooking oil to a 10 to 12 inch thick skillet, over medium heat. Add the potatoes. Cover and cook for 20 minutes until fully cooked. Shake and move the skillet every 5 minute so that the potatoes cook evenly and don’t burn. Turn down the heat to low and add the soy sauce, rice syrup, and garlic. Stir it all together with a wooden spoon. Turn up the heat to medium. Keep stirring and cooking for another 4 to 5 minutes until the sauce is reduced and the potatoes look shiny and wrinkly. Remove from the heat and mix with the sesame oil. Sprinkle the sesame seeds over top. Transfer to a serving bowl and serve with rice. Refrigerate any leftovers for up to 4 days. Posted on Monday, March 30th, 2015 at 6:22 pm. Posted February 2nd, 2019 at 6:27 pm | Log in to reply. Hi maangchi! I made this dish and it turned out super delicious! I do not have rice syrup so I instead used brown sugar and it still came out so good. I love your recipes! Posted October 13th, 2017 at 1:10 am | Log in to reply. It takes awhile to cook but the dish was very popular with my friends. Posted September 30th, 2017 at 8:56 pm | Log in to reply. Posted October 19th, 2017 at 10:28 pm | Log in to reply. Wow looks perfectly shiny and wrinkly! I’m glad you enjoyed it! Posted May 13th, 2017 at 4:09 pm | Log in to reply. I made this side dish with my husband in mind. He really loves potatoes and any dish really that incorporates them into it. When I saw this video, I instantly thought of him and how he would enjoy the dish. Turns out two of our boys also enjoyed the dish and he ended being raided by a one and three year old every chance they got. It was cute to watch. Thank you for the wonderful recipe as it gave my family a wonderful memory! Posted April 27th, 2017 at 8:00 pm | Log in to reply. Thank you for the recipe! I made it a couple times now and it’s great to go with rice and also so good as a little snack to keep in the fridge! Posted November 8th, 2015 at 10:20 pm | Log in to reply. I’ve made this a few times since seeing the video, but a few weeks ago I tried it with carrots. Just cutting them into chunks and cooking them the same way. They turned out delicious! My mother-in-law says that she wants to use the recipe on chicken next. Can’t wait to try this with so many different things! Posted November 5th, 2015 at 8:05 pm | Log in to reply. 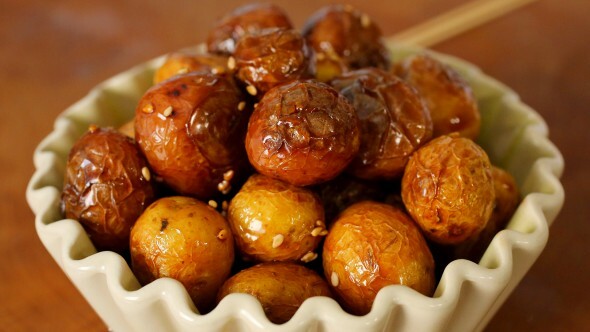 I just made some of these and they are absolutely delicious, but my mom thinks they need some spicing up… If I picked up some gochujang, would that work? Or maybe some garlic salt? Posted November 6th, 2015 at 7:13 pm | Log in to reply. Adding some gochujang sounds great to me! Posted August 17th, 2015 at 1:56 pm | Log in to reply. I made these potatoes last night and they didn’t turn out exactly right, but were ok. I think the potatoes were too big. I couldn’t find ones as tiny as quail eggs, the ones I got were golfball-sized. I had to cook them longer and the sauce basically burned (turned black and tasted burned). 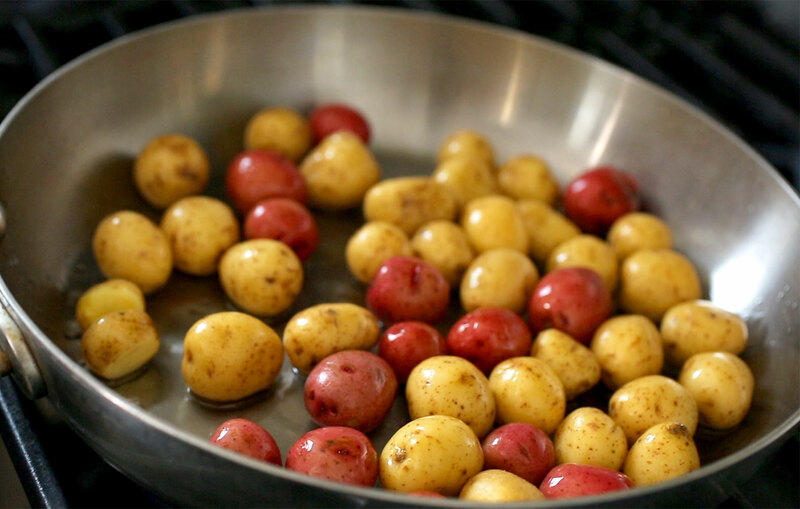 If I can’t find the small potatoes, would fingerling potatoes work? Or should I microwave the potatoes to cook completely before putting them in the sauce? Posted August 18th, 2015 at 8:11 pm | Log in to reply. Posted August 6th, 2015 at 10:00 pm | Log in to reply. Thank you for the recipe Mangchi!my family enjoyed it! Posted April 8th, 2015 at 3:38 am | Log in to reply. I can’t wait to make these! I moved out of state in the beginning of last month, and I’m homesick for home-cooked meals. There aren’t as many Korean stores or restaurants in Las Vegas as there were in the Chicago suburbs, so I’m glad I found you when I did, and I paid attention to my Korean side as much as I have. Hopefully with your help, and years of watching Eoma, I’ll make both of you proud. Posted April 8th, 2015 at 9:58 am | Log in to reply. Posted April 3rd, 2015 at 4:01 am | Log in to reply. I have three kids and zero creativity in the kitchen. Ever since I saw your video on Korean fried Chicken a few months ago I’ve started cooking up a storm! My family has enjoyed korean fried chicken, fried rice, and steamed buns. I made these potatoes tonight and it was another hit! You’ve made cooking so easy and fun for me and I can’t wait to do more. Thank you! Posted April 3rd, 2015 at 6:55 pm | Log in to reply. It sounds like your Korean cooking has been going well! Cheers! Posted April 1st, 2015 at 5:15 pm | Log in to reply. I just bought baby potatoes, gonna try this recipe tomorrow. But I’m afraid I won’t find the syrup. What can I use as substitute? Posted April 1st, 2015 at 5:37 pm | Log in to reply. Use honey or brown sugar. Good luck! Posted April 1st, 2015 at 10:06 pm | Log in to reply. Posted March 30th, 2015 at 9:15 pm | Log in to reply. (1) I have Korean corn syrup at home but I don’t have rice syrup. Can I use corn syrup for the recipe? Or will honey and sugar be better substitutes of rice syrup? Posted March 30th, 2015 at 9:52 pm | Log in to reply. Posted March 31st, 2015 at 10:00 am | Log in to reply. This recipe was originally posted on March 30, 2015 at 6:22 pm by Maangchi. The video was watched 695,357 times on YouTube & has 12,047 likes!